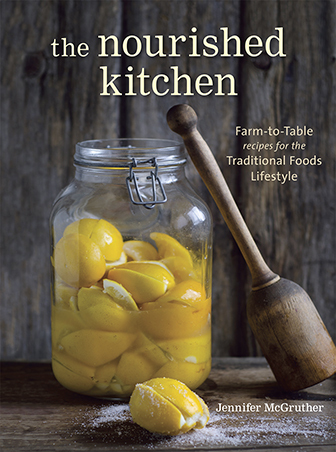 Erin Alderson, the author of the The Homemade Flour Cookbook (my new favorite), enjoys a distinct passion for whole foods: grains and seeds, lentils and beans, fresh vegetables and fruit. She celebrates them, coaxing out nuanced flavors with an expressive and ingenious approach to old-fashioned comfort food in recipes like Millet Pot Pies, Corn Cakes with Spinach and Cilantro Sauce, Gorgonzola Mac and Cheese and this Summer Berry and Oat Cobbler that I’m sharing with you today. I’ve been a long-time fan of her site Naturally Ella which focuses on simple, but flavor-forward whole foods recipes, and was thrilled when her publisher mailed me a copy of her new book. The Homemade Flour Cookbook is a lovely book of simple, but inventive recipes that are flavor-forward without being over the top. It also provides guidance on working with whole-grain and freshly milled flours, as well as flours made with nuts, seeds and pulses like chickpeas and lentils. She guides you through the benefits of working with freshly milled flours (as opposed to whole-grain, store-bought flours which are prone to rancidity). While I strongly prefer using my electric grain grinder and roller combo, Erin’s guidance The Homemade Flour Cookbook provides information on using a wide variety of kitchen appliances such as handmills, food processors and high-powered blenders so that even if you don’t want to purchase an electric grain grinder, you can still enjoy making your flour at home. 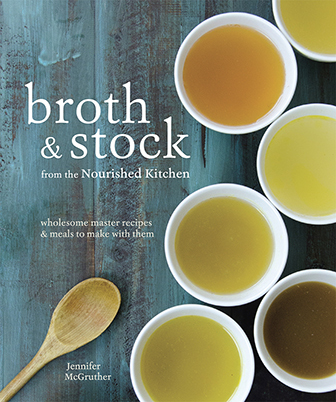 (And, as an aside, you can also enjoy the book even if you don’t choose to mill your own flours because the recipes are lovely, simple and you can purchase the flours at most natural food shops). When my family transitioned to a traditional foods lifestyle, based on the principles of the Weston A. Price Foundation, one of the first purchases I made was a grain mill (actually it was a Christmas gift from my mother-in-law). The moment a grain is ground into flour, its nutrients begin to degrade, particularly its vitamins and antioxidants. Moreover, the naturally occurring fats found in whole grains are prone to rancidity which compromises both the nutrition of the food you eat, and its flavor as well. In keeping with Nourished Kitchen’s focus on traditional foods (and these principles), I typically process my grains before cooking them through traditional methods like sourdough fermentation (here’s my tutorial on working with a sourdough starter) or soaking overnight in a bit of buttermilk or yogurt (as called for in these yogurt crackers) or by means of sprouting (learn how to sprout grains here). Keep in mind that The Homemade Flour Cookbook is not a cookbook that uses these techniques; however, most of Erin’s recipes can be easily modified for those of you who wish to consume only soaked, soured or sprouted grains and pulses. In The Homemade Flour Cookbook, Erin provides information on grinding grains using a wide-variety of kitchen appliances such as coffee and spice grinders, high-powered blenders, hand mills, food processors and electric grain grinders. So even if you don’t have, and aren’t interested in purchasing a grain grinder, you’ll find a lot of value in the techniques she covers. Electric grain grinders are expensive, and they’re something you save up for. My frist grinder was a Nutrimill which retails for a little over $200. I loved it, but it was ridiculously loud and prone to puffing as plumes of flour would escape during grinding from time to time. About 5 years after I received it, it stopped working, and I saved and saved for the Komo Fidifloc mill which is a combination of an electric grain grinder and flaker (it retails for about $700). The Komo mill is very quiet by comparison to the Nutrimill. It doesn’t puff, and it offers a wider array of settings from very fine, to very coarse. But, again, it’s expensive. 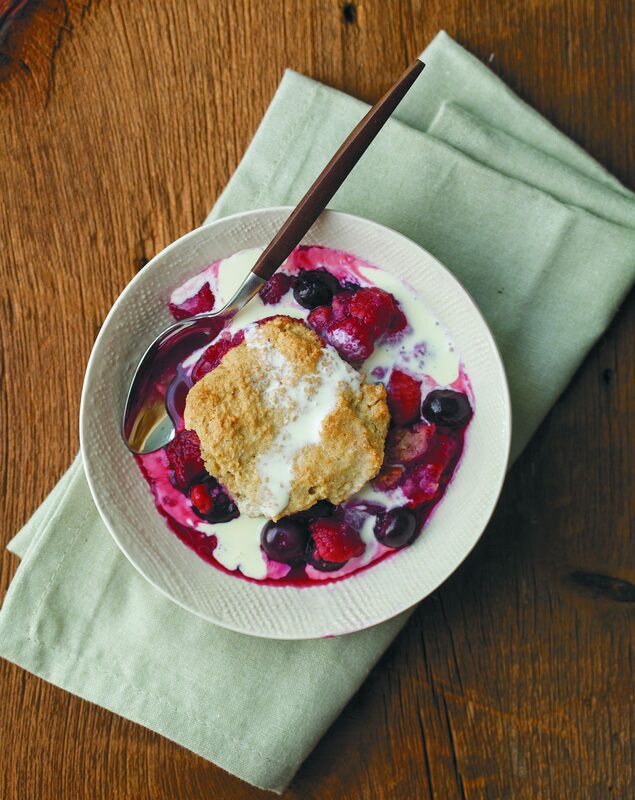 The mix of berries topped with an oaten biscuit, makes for a lovely dessert or breakfast - especially when topped with homemade yogurt or kefir. This recipe is republished from The Homemade Flour Cookbook by Erin Alderson (Fair Winds Press, 2014). To make the filling, combine the berries, maple syrup, sugar and cinnamon in a pot and bring to a boil, cooking for 3 to 4 minutes as the berries expel their juice. In a small bowl, whisk together the cornstarch, water and lemon juice until smooth. Pour into the boiling berry mixture and cook for 2 to 3 more minutes, stirring frequently, until the mixture starts to thicken. Pour into a 9-inch round baking dish. To make the topping, combine the oat flour, baking powder and salt in a large bowl. Cut in the butter, until the dough is in pea-sized pieces. In a small bowl, whisk together the egg, milk and maple syrup. Pour the wet ingredients into the dry ingredients and stir until a dough forms. Break off golf ball=size pieces of the dough, lightly pat into a circle and place over the berries. Continue with the remaining dough. Bake for 25 to 30 minutes, until the filling is bubbling and the topping is golden. A Note from Jenny: To soak the dough for the cobbler, simply prepare the cobbler dough with buttermilk or sour milk in place of milk, and omit the egg and baking powder. Leave it well-covered on the countertop for 8 to 12 hours, then return to it the mixing bowl, beat in the egg and baking powder, and form as required in the recipe. Can you sub arrowroot powder for the cornstarch? I haven’t tried that, but I think that would work. I haven’t got a flour mill (yet) – but I remember when I used to work in a health food shop which had a mill – and for a small fee would grind the grains fresh. Soooo good. the recipe looks beautiful by the way. It appears that both mill links bring me to the amazon page for the Nutrimill. Do you happen to have the link to the Komo Fidifloc mill that you use? Thanks! Maybe I’m just missing it – but bake at what temperature? Can I use coconut butter and milk instead of regular butter and milk ? I am allergic to corn. Can I sub xantham gum in lieu of cornstarch? both mill links go to the nutrimill. Also I think I need to make this tonight. looks yummy! Wouild kefir work just as well as buttermilk? If you are soaking when do you add the butter? Thank you SO much for providing a printer-friendly link! I don’t see an oven temperature either, 375? One additional note, the instructions call for cinnamon to be mixed in with berries in pot, but there is no listing of cinnamon in the ingredients. Is there supposed to be cinnamon in this recipe? What temperature and how much cinnamon do you add to the berries? It is not listed in the ingredients but mentioned in the directions. Thanks!! I’m guessing at 350 degrees… hopes it turns out! I baked it with 1 tsp of cinnamon and at 375 degree ( I started with 350 and then upped it to 375 a few minutes in) and it was perfect at 25 minutes. Hi, I’m allergic to eggs and wondering what would be a good substitute for the eggs in this recipe? So, I made this today and it was sooooooo good!! Actually, I’m about to go have another bowl! My kids loved it and I even shared it with my neighbor! 🙂 I went ahead and just omitted the eggs since I’m allergic and it still turned out amazing. I also soaked the flour overnight with coconut buttermilk (coconut milk with lemon juice) (we also have dairy allergies in our house). I used more milk, it just didn’t seem wet enough to soak, so I ended up using more like 1-1.5 cups of milk. I also added some turbinado sugar to the oat flour dough when I mixed it, it was a little too bland/sour, as well as sprinkled a little bit on top when I baked it. This sounds delicious!! I have a bake sale coming up and I’m always looking to make something different. Do you think this would do well in individual sizes? Maybe those foil/tin mini bread loaf pans? My husband and I were just talking about whole grain baking (like REALLY whole grain…. grinding flour and alternative sources of flour etc) yesterday! how very timely! thanks so much for the lead to this book and these recipe ideas. 🙂 And Happy Lammas ( first harvest of grain/ loaf-mass)! Do you know what the nutritional information is? I don’t provide nutritional information. If you need it, plug the ingredients into a nutrient calculation tool.